Our panel of local real estate and design experts consider how the latest lifestyle and real estate trends are impacting the local market and landscape. Panelists (from left to right): Joshua Rosensweig, Lori Schiaffino, West Chin, Dana Trotter, Robert Kaufman and Angelo Varischetti. 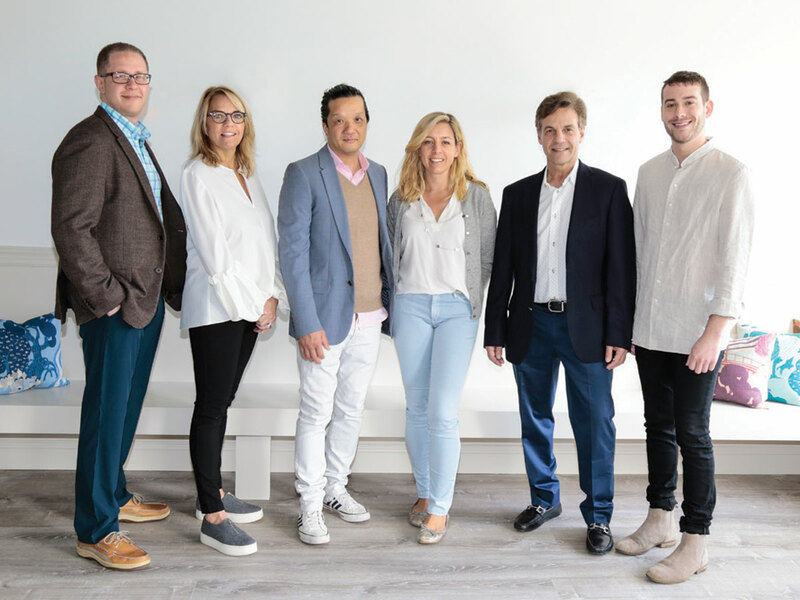 For the final issue of this Hamptons season, we gathered a group of panelists—architects West Chin and Joshua Rosensweig, home automation guru Robert Kaufman, brokers Lori Schiaffino and Dana Trotter and interior designer Angelo Varischetti—to discuss what trends they’re seeing, and what Hamptons homeowners, buyers and residents will be seeing over the seasons to come. I want to address trends of two parallel tribes. One is real estate; one is lifestyle. So let’s jump in on the real estate part: Where is the market based on current performance? DANA TROTTER: There is quite a lot of inventory. We’re seeing price reductions daily. There may be a little bit of a correction where sellers are becoming more realistic. LORI SCHIAFFINO: People have more confidence in what’s happening in the market, even though there’s volatility. There’s a lot of capital to be deployed, so we’re seeing more buyers. 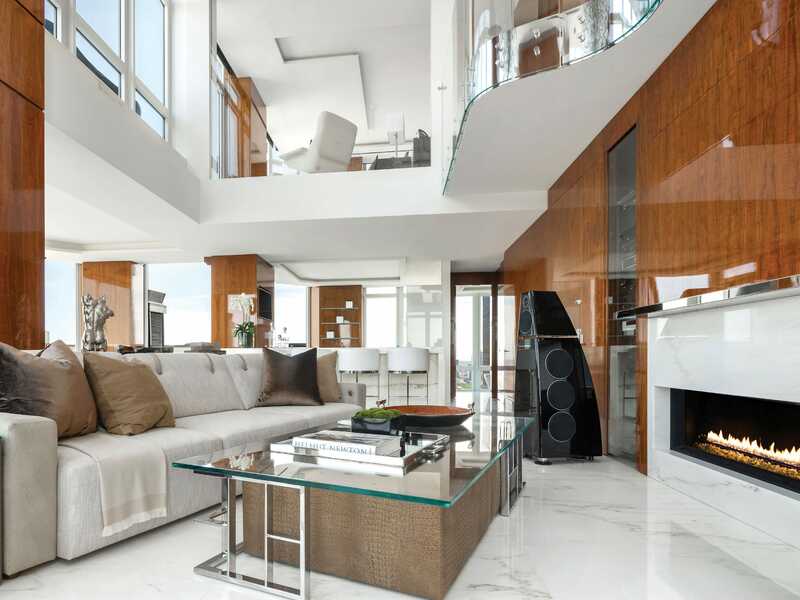 DT: The high end is where we’re seeing a lot more inventory, and a lot of my buyers are mostly either downsizing or upsizing, so they’re not in a huge rush. JOSHUA ROSENSWEIG: We see that in the architectural world. A lot of clients who come to us before they purchase a home are looking to see what can be done in that home. They need to understand some of the regulatory agency effects on principal building. ROBERT KAUFMAN: I’ve been dealing with the town of Southampton trying to get a permit, and every time I think it’s ready to get accepted, there’s another regulation. JR: We’re seeing a very aggressive time from the environmental agencies in protecting certain bulkheading features and waterfront features, and trying to take back more area of the land to increase buffer zones. New sanitary systems that we’re dealing with... it’s slowing up the process. It’s affecting our forecasts. Audio Command Systems founder Robert Kaufman says that breathtaking audiophile performance is integrated by using speakers—in the case of his client’s home shown here, Meridian digital active speakers—that can become a design element while fulfilling the performance desires of the homeowner. Are you seeing any locations hotter than the others? WEST CHIN: I think for New Yorkers, the Hamptons is the Hamptons. But for the global market, it is Montauk. Montauk has become a destination for nightlife, entertainment. It is like Capri or the south of France—people just gravitate to it. LS: I’ve seen an uptick in Quogue; you can get great value there. ANGELO VARISCHETTI: The turnkey show home that we just sold is in Water Mill. It’s barn-transitional style, with white shellac, black windows. It’s very organic, very light, and it’s just simple and easy—New Age beach. Tell us what demographic you’re thinking about when you’re designing. AV: It’s definitely younger. I think the surge of this younger wave that’s coming through—they want to go home, but they want to go out while they’re at home. So, with that, half the walls on the main floor are just panelled doors that go out and bring the outside in. WC: It’s also a demographic that wants instant gratification. Not interested in going through the process of architects, contracts, designers and permits. AV: I always joke around they design their house off Pinterest. The whole house, top to bottom. They come to you and they say, ‘Hi, you’re my interior designer, but here’s the house.’ And they have everything picked. It’s like booking an Uber. RK: Buying or building, they are looking to have something much faster than other generations. DT: That’s why there are so many custom spec houses today. People used to come out, find their fabulous piece of land, build their dream house, be involved in every detail, and those are few and far between at this point. JR: We do all custom homes and the process is long, and everybody who comes to us understands the process, the timeline. They don’t want exactly what’s in the pictures; they want something that’s different but evokes some of the same aesthetic. To see the pictures helps us get through to their minds a lot quicker, but they want something unique. At a home designed by Austin Patterson Disston Architects, an ample pool house for entertaining with a bar, kitchen and seating area and an upper rooftop terrace. Tell us how your business has changed. RK: It’s evolving. We take people’s designs, or take their dream, and create a design in the technology world. And now, with the ‘Internet of things,’ everyone wants their iPhone to control everything, from not only in their house, but wherever they travel. We’re also trying to tie wellness into the whole house, from circadian lighting, which gives you different color palettes during certain times of the day, to monitoring air and water. JR: What used to be a convenience or something that people would want to have—in solar or wind or solar hot water or geothermal or PV electric—is now becoming more of a requirement based on the updated building and energy codes. RK: We want to make sure that our clients, when we come out on the weekends, are having 24/7 people on call. Service and responsiveness is another thing for this generation. They don’t want to wait for a Monday truck to come. On the market from Dana Trotter at Sotheby’s, a dining room overlooks the rear grounds with vineyard. AV: People now want to live outside but not leave their home, so outdoor kitchens, cabanas, they’re getting bigger. There’s this whole other lifestyle where they’re barely inside. LS: It brings back conversation to our lives. It’s just so nice to be able to be outside, be with friends and have conversations. AV: I think the younger generation is not worried about going out to dinner and being seen here and there. DT: People are wanting to grow their own food and cook it outside. That’s becoming a big trend. 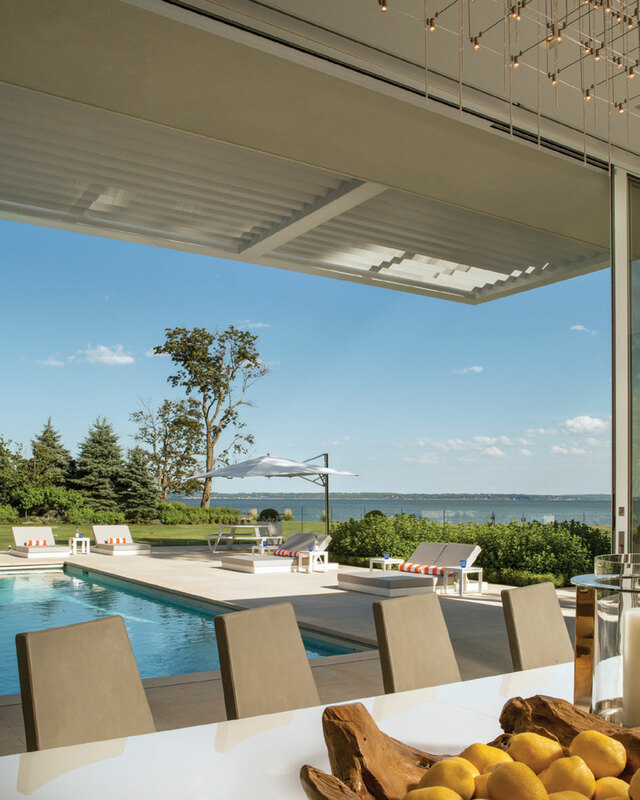 Farrell Home’s show house in Water Mill. Why is this a trend now? WC: It’s the availability of information, from Pinterest to Houzz to Instagram. Like you see a lot of ‘upside-down’ houses now. When you have a flat roof, especially when there are views available, or when there’s a landscape that doesn’t work well toward a swimming pool on the ground floor, then the barbecue and the outdoor kitchen is huge on the roof, for the view. RK: Outdoor entertainment’s a huge thing. Not only sound outside, lighting outside, but I’ve put movie theaters outside. It’s not only going to be a trend, it’s going to become a standard. Trends that become standards become ways of life. AV: I’ve changed so many rooms around to accommodate technology. I think technology is going to drive design way more than we think. In simple terms, if you can’t fit the room in an Instagram post, then it’s probably too big to buy. WC: Instagram adds to this conversation in many ways. You can now see what everyone else is doing around the world. They’d rather have a 3,000-square-foot house in East Hampton versus a 7,000-square-foot house, and spend four months here or three months here. DT: The upper end is definitely saturated, but when something sellable comes on the market at any price point, it goes. 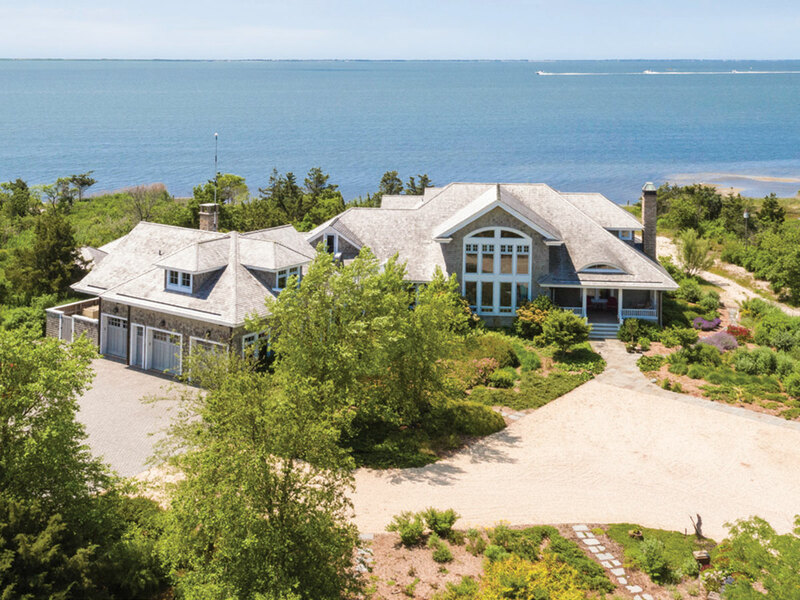 An aerial view of a listing on the Great South Bay from Lori Schiaffino of Compass.